The other name for Periodic Table is Mendeleev’s Table that contains all chemical elements that exist on Earth. 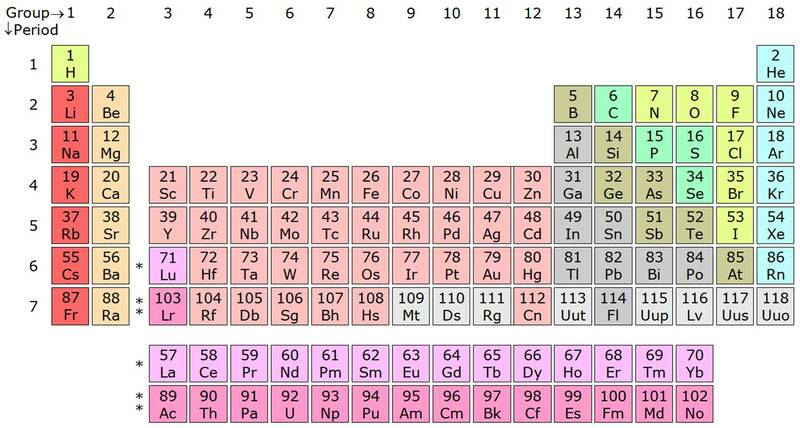 The table was proposed in the year 1869 where elements were arranged based on their properties. Although many more elements were in existence prior to that as well, it was the most organized form for scientists where new elements are added as soon as they are discovered. The structure of the table is quite significant that holds 117 chemical elements in a very distinct order based on their chemical properties. Out of all, 94 elements are given by nature and 24 has been made synthetically by scientists. You can quickly distinguish between metals and non-metals by looking at the table. Metals are placed on the left-hand side and non-metals are placed at the right-hand side. Further, atoms are arranged based on their increasing atomic numbers in rows and columns. There is a unique symbol for each chemical element and their properties are also different. Based on the properties, the chemical elements are divided into periods, blocks, and groups. Groups are arranged in the vertical rows and columns are arranged in the horizontal rows. And there are groups in the periodic table like – s-block, p-block, d-block, and the f-block. The location of the element within a periodic table is highly important based on properties of chemical elements in rows, columns, or blocks. This is easy to predict the properties of an element based on its location. However, trends will differ in the periodic table once you move from the vertical direction to the horizontal along the table. The trends of groups can be explained by common electronic configurations in their valence cells. They are usually explained on the basis of electronegativity, ionization energy or the atomic radii etc. For each chemical element, there is proton, electrons, and neutrons too. When moving from left to the right, the atomic radii would decrease and the ionization energy tends to increase. At the same time, when moving from left to the right, the electronic affinity and electronegativity will increase. In the early times, scientists assumed that properties of a chemical element are the periodic function of their atomic masses. Based on this assumption only, there were placed 63 elements along the vertical columns and horizontal rows of the periodic table. But the proposal was rejected later because it was not able to explain the position of certain elements, rare earth metals or isotopes etc. Later, these defects were removed and put forward the modern periodic table based on the modern periodic law. He said that elements are arranged in the periodic table based on their atomic number, not the atomic masses. A tabular arrangement of elements in groups and periods which highlights the regular trends in properties of elements is defined as the periodic table. There are eighteen vertical columns known as groups in the modern periodic table which are arranged from left to right and seven horizontal rows which are known as periods.